I believe our forefathers were brilliant men when they drew the initial blueprint for this country. The idea of creating three separate and distinque branches of government to assure there were checks and balances against a possible tyrannical government was really brilliant on their part. For this reason i'm often upset when I hear politicians wanting to stack the court with justices of their liking. I believe this is dangerous to the future of our country. I also believe (and hope) that every Justice and candidate for the position are already able to set their own political opinions aside and rule on law itself. 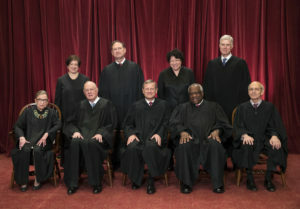 As one who continues to learn about the law and our constitution I have read hundreds of Supreme court decisions and can tell you that rarely ever have I seen politics play a role in these decisions. Politics have no place in the judicial system and for that reason I am for the appointment of judges rather their running for election. Judicial decisions cannot be based on keeping one's job, but rather on what the law dictate's.